Rotterdam is the second largest city in The Netherlands and is often compared to Amsterdam, the larger of the two cities. 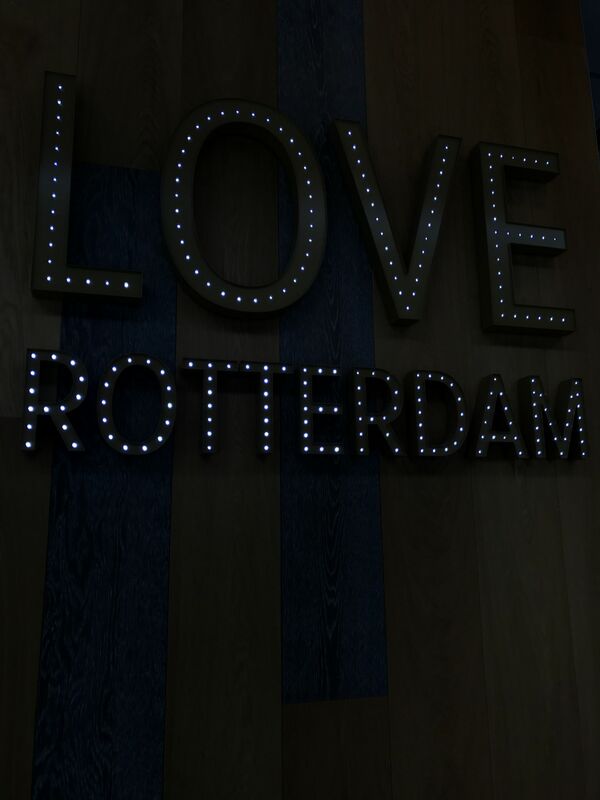 However, Rotterdam has its own story to tell, having been completely destroyed during World War II. 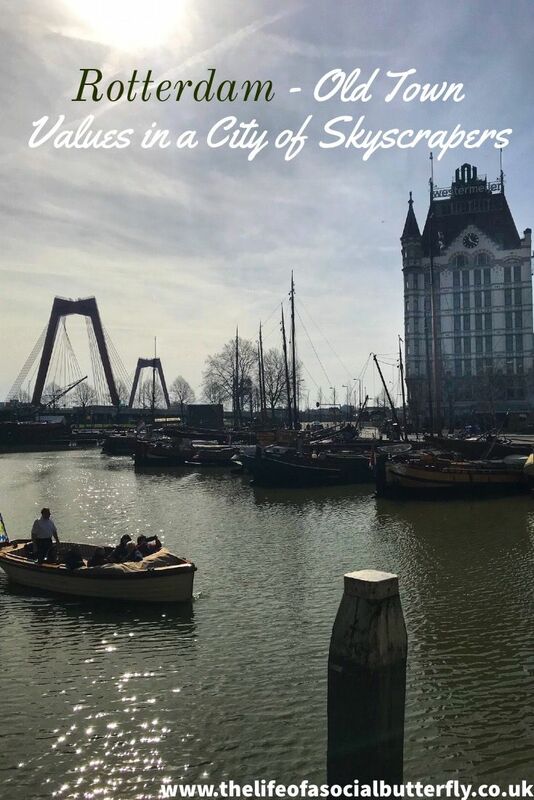 This post will give you insight into the old town values of the city that once was and show you what Rotterdam; a city of skyscrapers has to offer as a modern-day tourist destination. 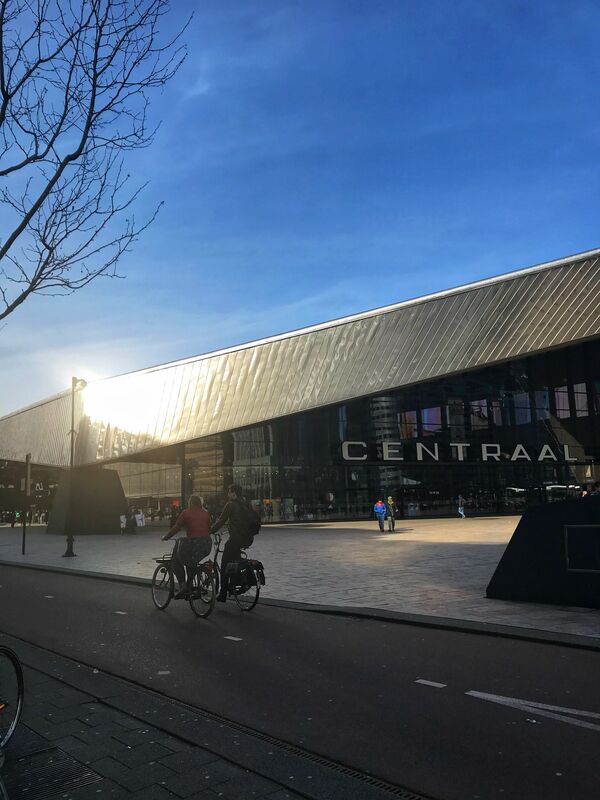 As the second largest city of The Netherlands, Rotterdam understandably has healthy competition with Amsterdam. 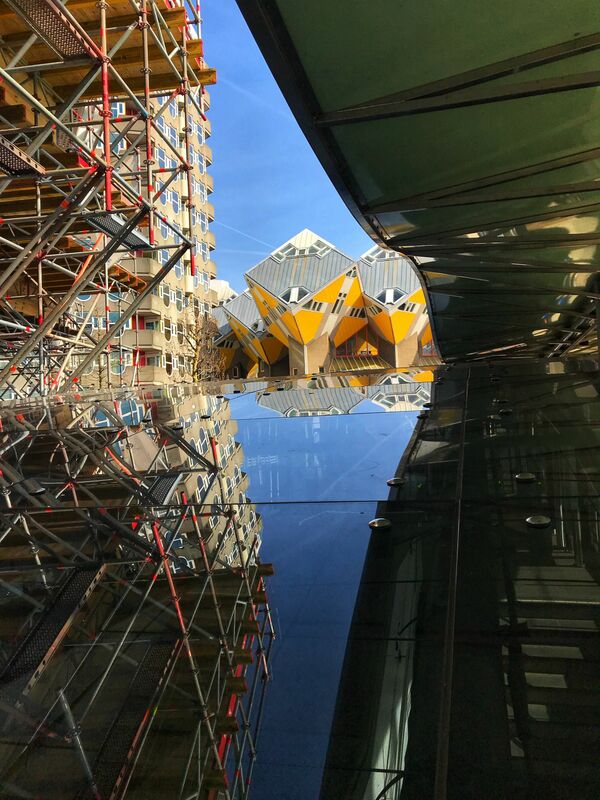 But what visitors to Amsterdam may not know, is that Rotterdam is in a league of its own; it is a city of the future. 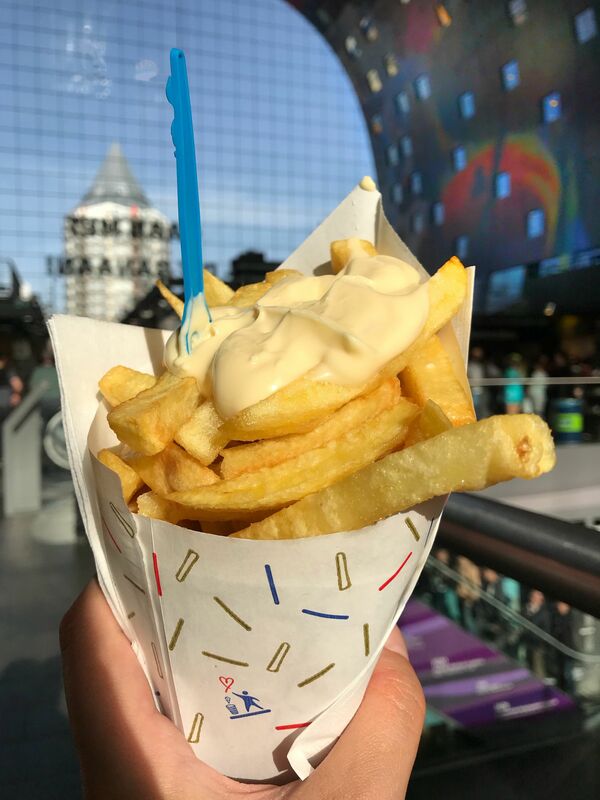 Located only 40 minutes from Amsterdam by train, Rotterdam has a very different skyline to the more traditional architecture you would expect to see in Amsterdam. 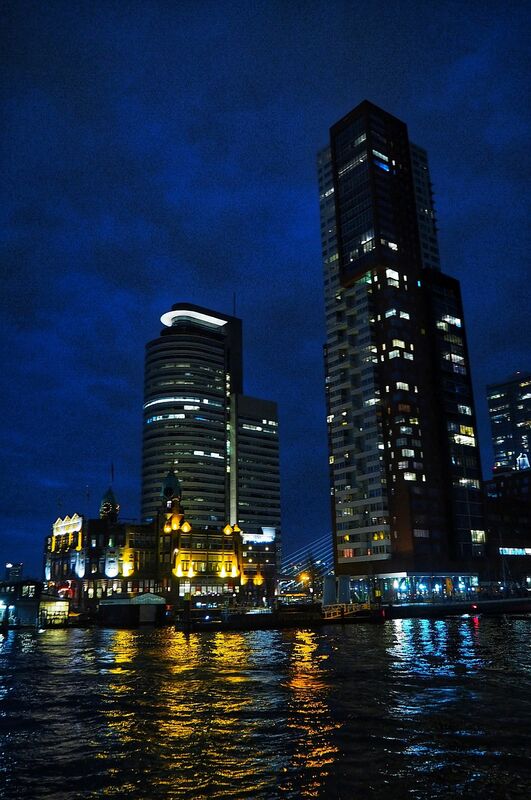 Rotterdam boasts one of Europe’s best skylines and is known for having one of the world’s largest ports. 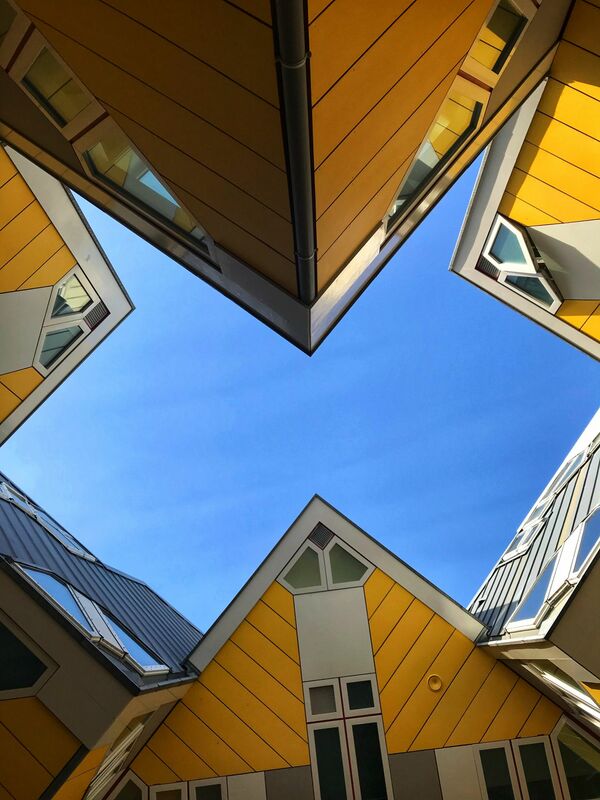 In more recent years, the innovative architecture seen in Rotterdam has become symbolic of a modern day Netherlands. Often dubbed the ‘Manhattan at the Meuse’, due to the skyscrapers collectively lining the river Meuse, the city may boggle your mind, altering your original perception of a more traditional Netherlands. 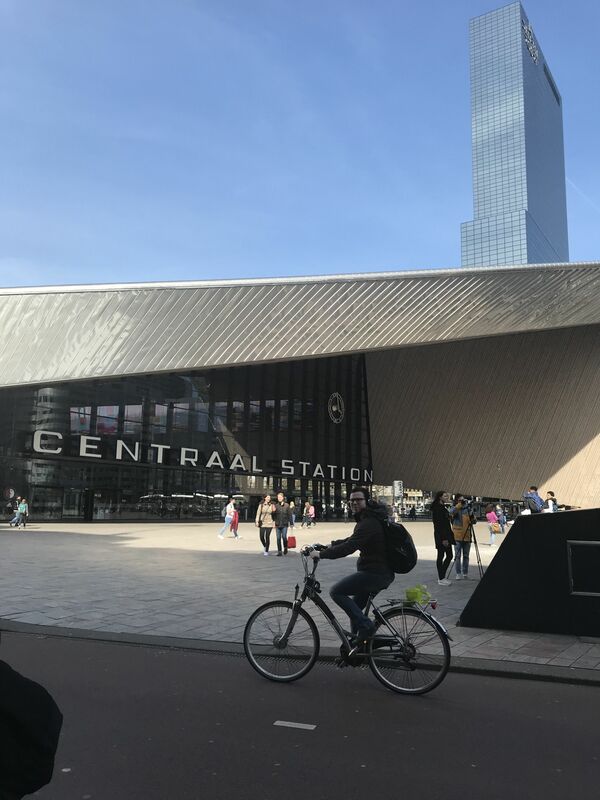 This blog post is indeed about a tale of two cities, as the title suggests, but not comparing Rotterdam to Amsterdam. For Rotterdam has far too much intrigue on its own. 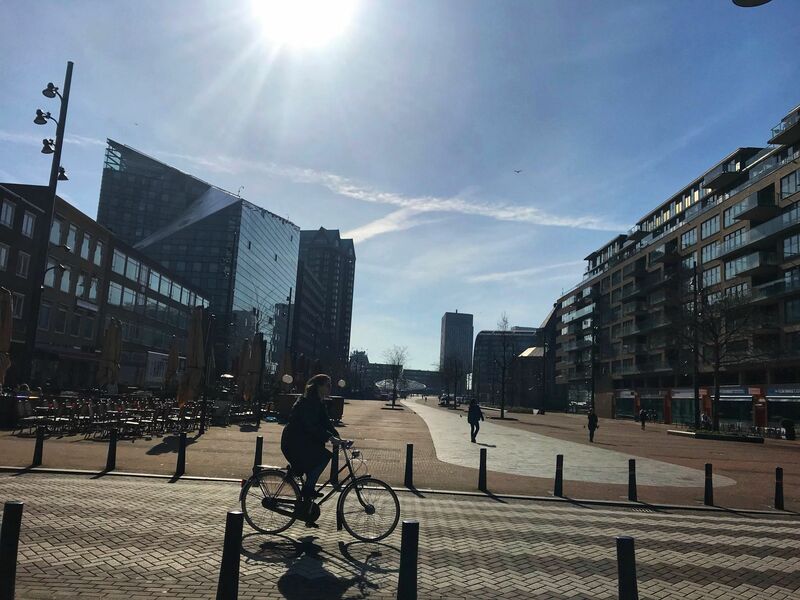 This post is exploring Rotterdam, a city defiantly rebuilt following the devastating impact of World War II. A city who lost its heart but rose from the ashes in a modern cloud of dust. 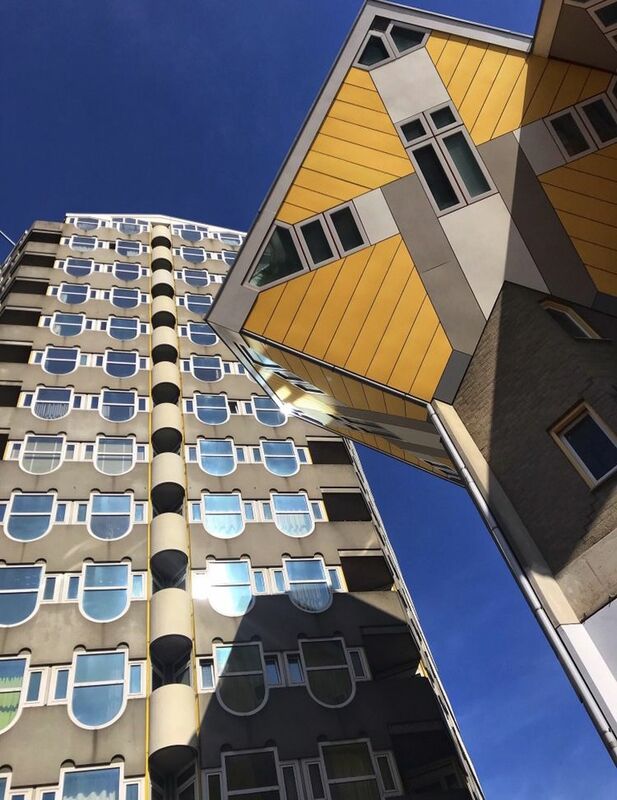 Whilst embracing traditional Dutch heritage, Rotterdam is a city reborn with a contemporary feel, where its old and new life have a dialogue. When visiting Rotterdam you really do get the sense of a tale of two cities. 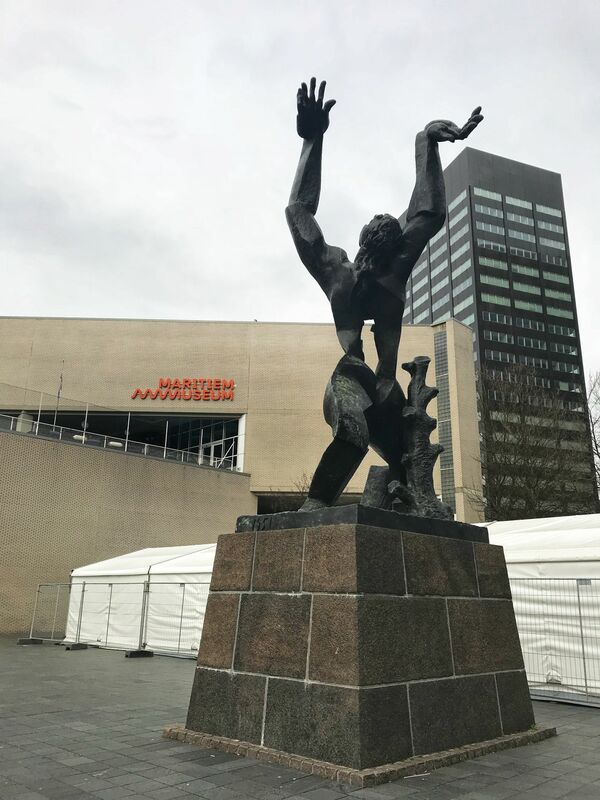 World War II had a devastating impact on Rotterdam, with the heart of the city utterly destroyed almost 78 years ago to the day. Many citizens who tragically lost their homes had no choice but to flee on the boats departing to America to seek a new life in the Promiseland. 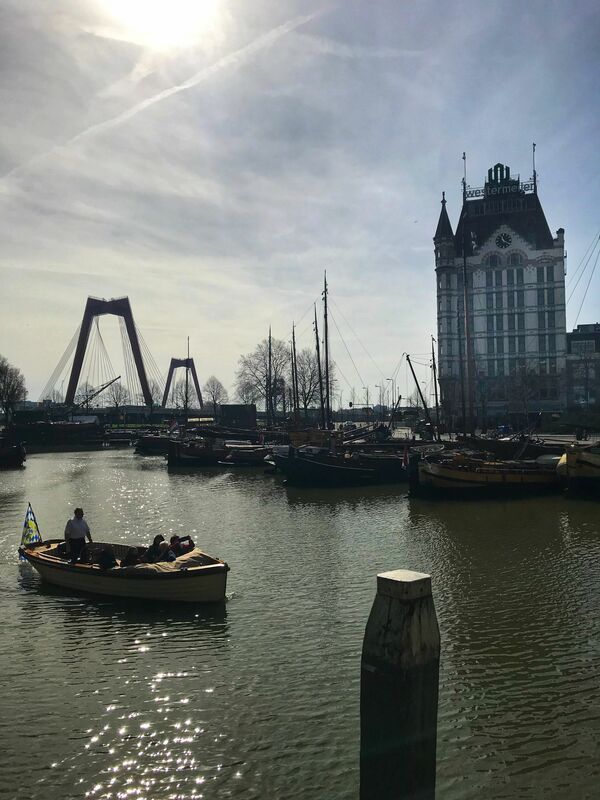 The boats left Rotterdam in droves from the old port, which still holds a remembrance for the city that once was. 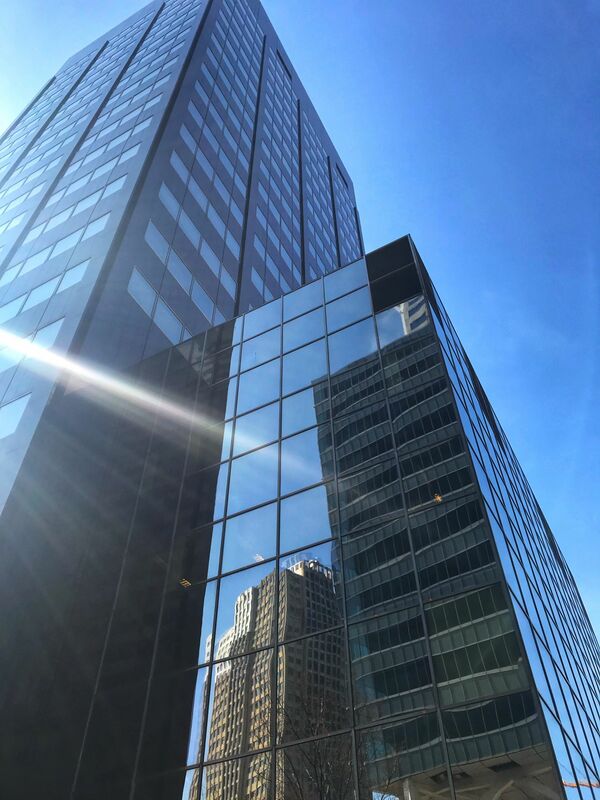 Hotel New York, the former head office of the Holland-America line, is now a national heritage site and a place where locals choose to eat, as well as newcomers staying in the city. 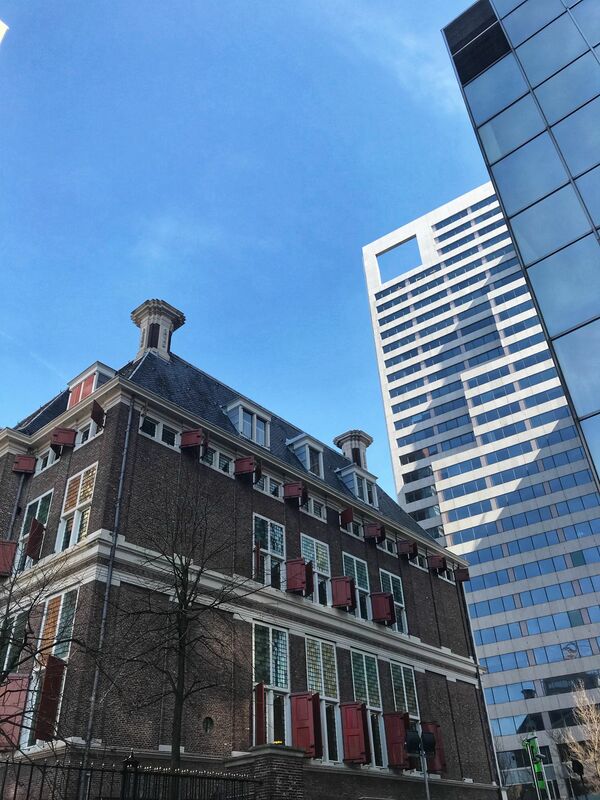 Whilst there is no doubt that Rotterdam is a modern city, echoes of the past can still be seen on streets where the traditional buildings remain. The City Hall and St Laurenskerk Church are some of the oldest buildings missed by the Nazis in the WWII air strikes. 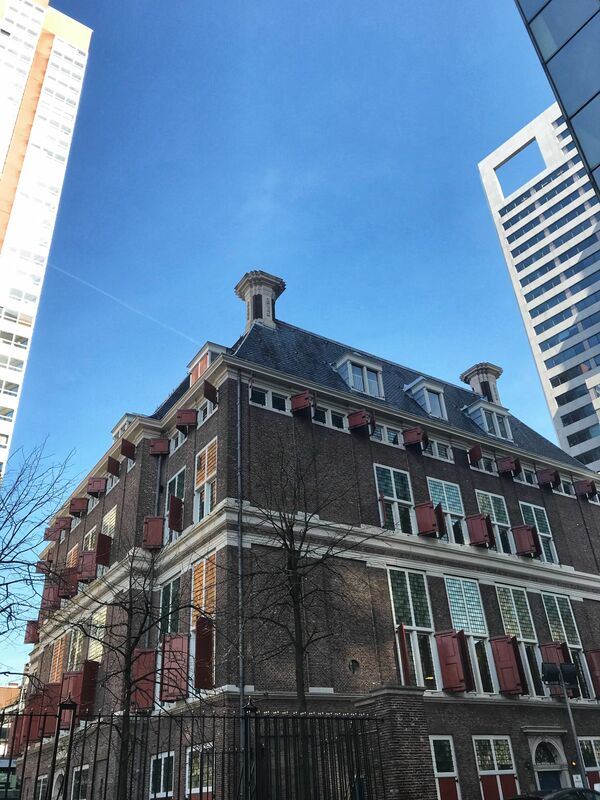 I was awestruck by Witte Huis (Rotterdam’s very own White House) another older building that still remains. 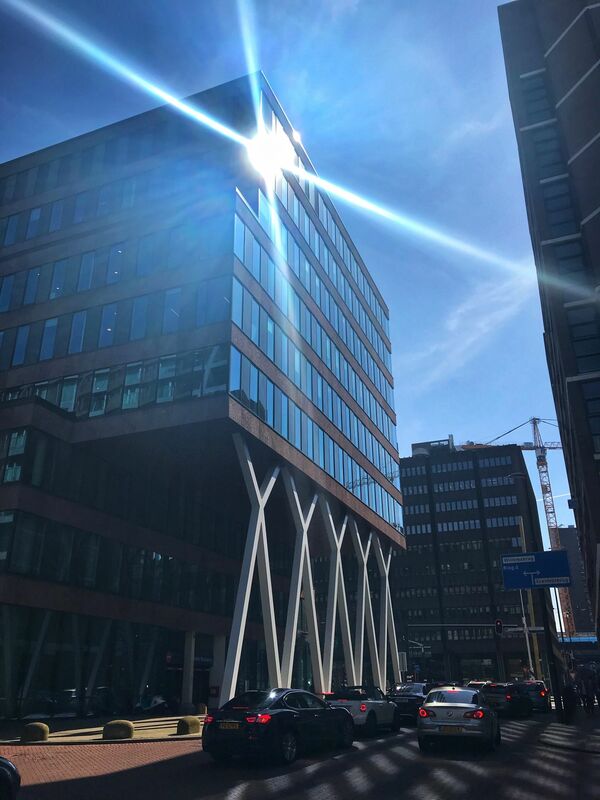 Restored in the ’90s, it is hard to believe that Witte Huis was once the highest building in Europe at 43 metres high! I observed Witte Huis for some time, after all, it is located opposite the Citizen M Hotel where I was staying. It was only later I discovered the building had been built in 1900 as it blends in perfectly with the cafes and structures lining the river. 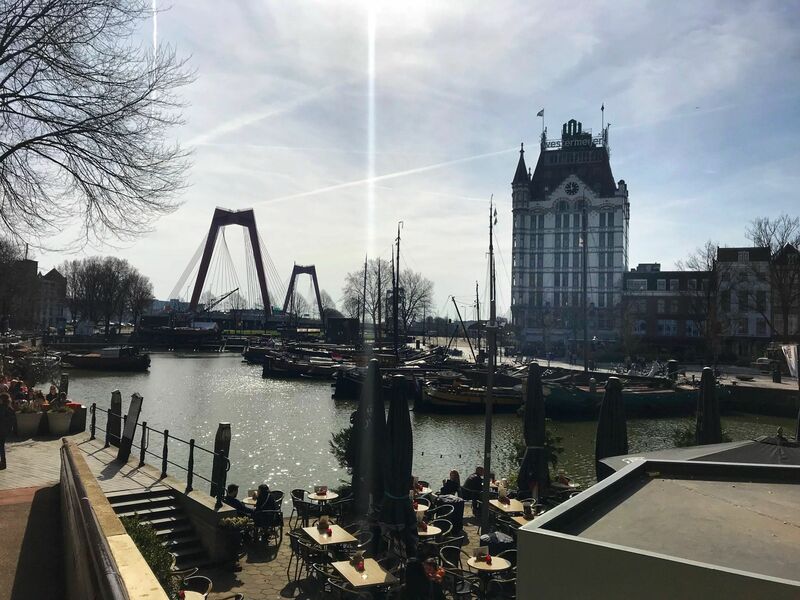 If you want to get a glimpse of old town Rotterdam and see what the city looked like before the war, head to Delfshaven, a borough of the city that wasn’t destroyed in WWII. In Delfshaven you will find a canal, traditional Dutch architecture, and a windmill! Whilst there are most definitely echoes of the past, the city stands completely rebuilt with a newly found defiance in its heart. 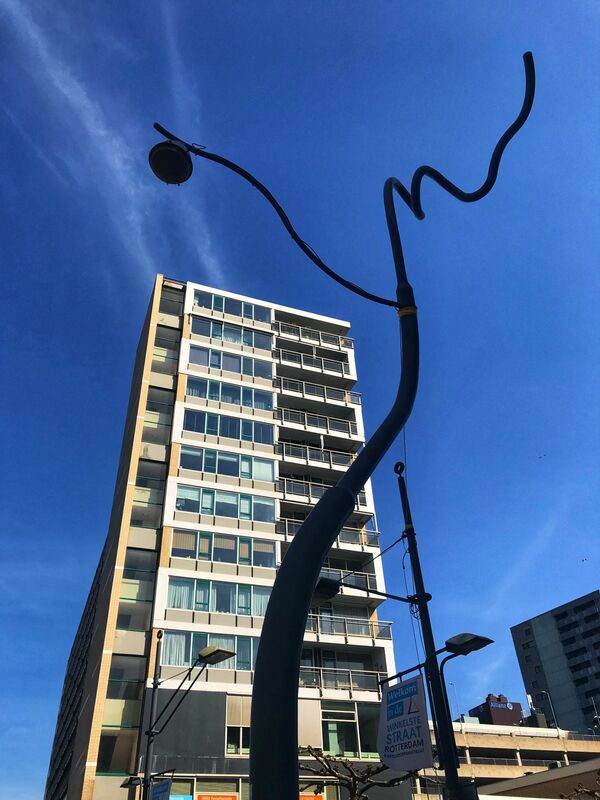 Ossip Zadkine’s poignant statue of a man without a heart, entitled ‘The Destroyed City’ depicts the heartbreak and loss to the city after the WWII bombings. One thing that struck me during my time in Rotterdam is that the city is anything but heartless. The old town Rotterdam values still live on in the modern city. 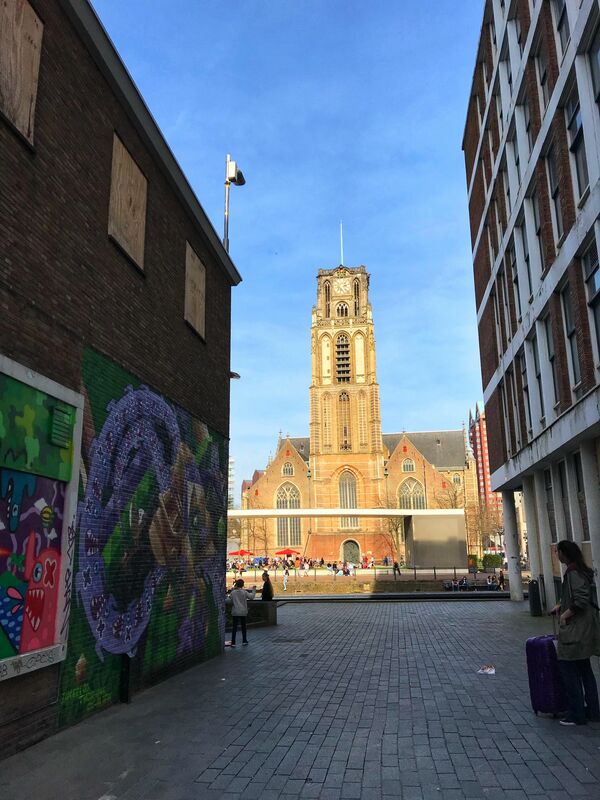 With the historical architecture destroyed, all that remained were the traditional values of goodwill and an optimistic outlook on life; appealing Dutch traits that I myself have acknowledged on my trips to The Netherlands. 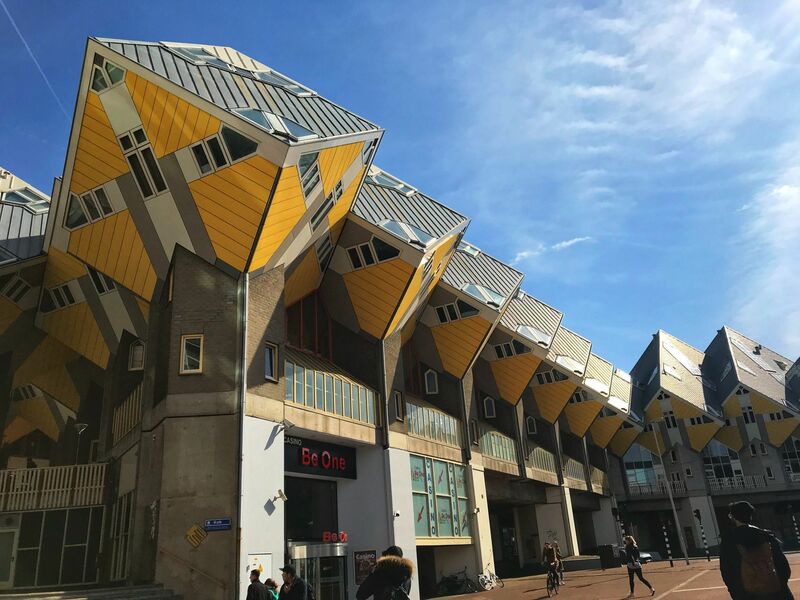 The city came together to reimagine and build a new Rotterdam, one that appealed to the food-centric city and, of course, a love of architecture. 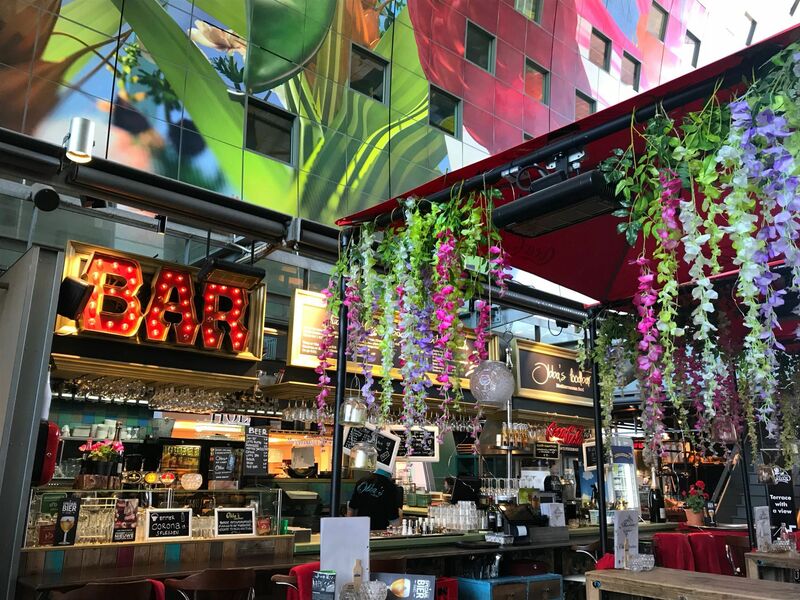 There are some amazing places to dine in Rotterdam, including some vegan-friendly cafes and restaurants. Keep reading for some of my favourites later in the post! 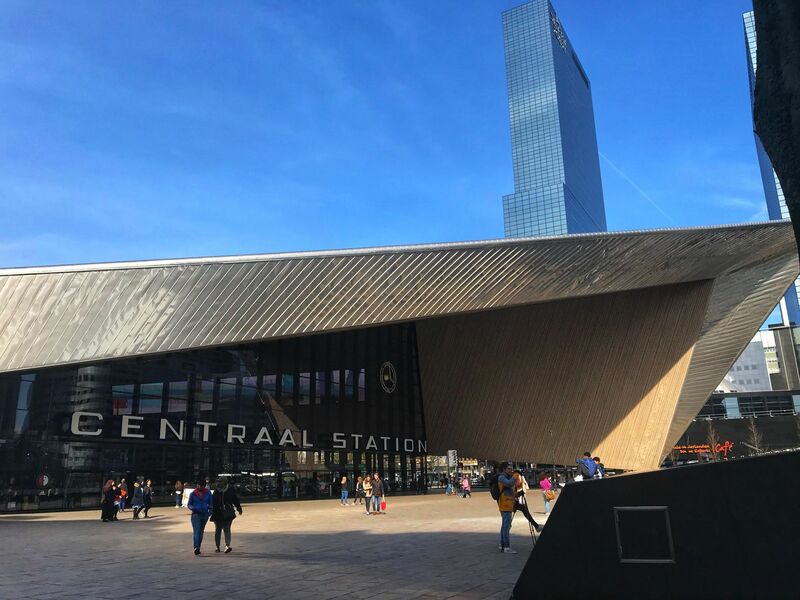 I can’t talk about amazing modern structures of Rotterdam without a nod at the Cube Houses, Centraal Station and Erasmus Bridge, but more details of these structures are included in my Best Things To See & Do as a Tourist in Rotterdam Netherlands post. 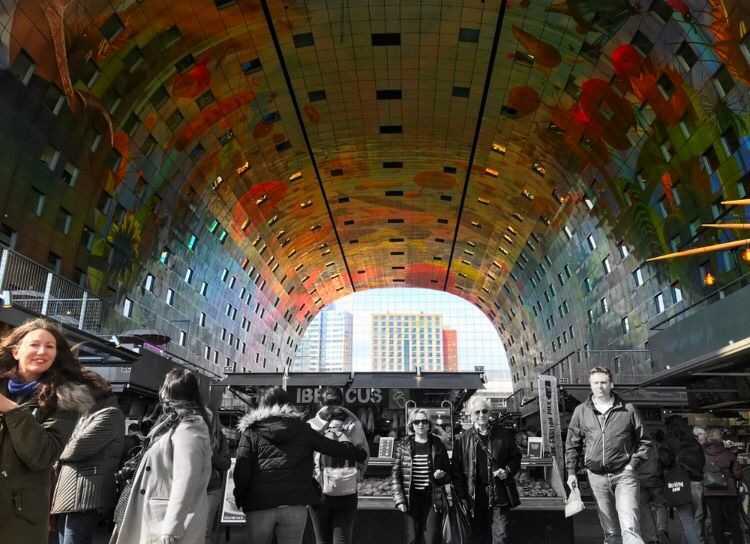 In the meantime, I introduce you to Markthal. 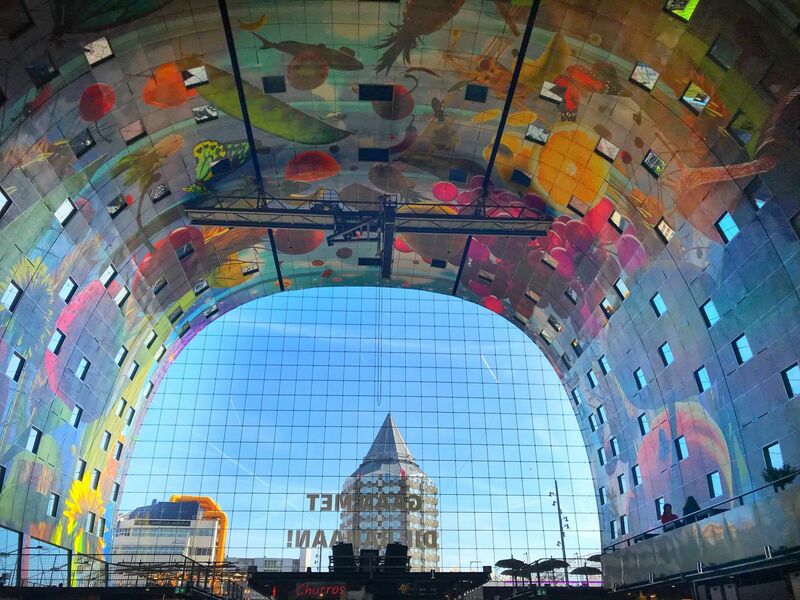 This dome-shaped building, created by MVRDV, combines the Dutch love of architecture and food, containing various world cuisines and restaurants. 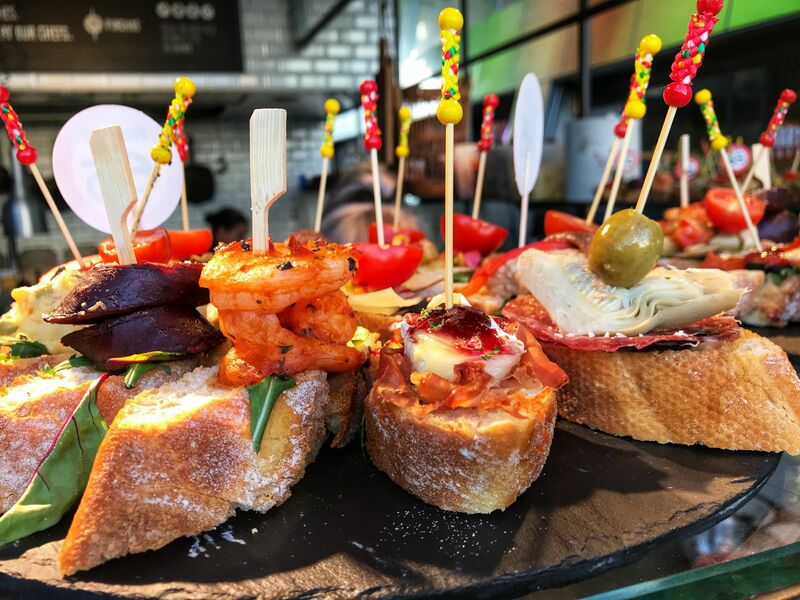 You can get everything from Portuguese pasteis de natas (I loved these in Lisbon) to pinchos and Dutch fries with, of course, mayonnaise! 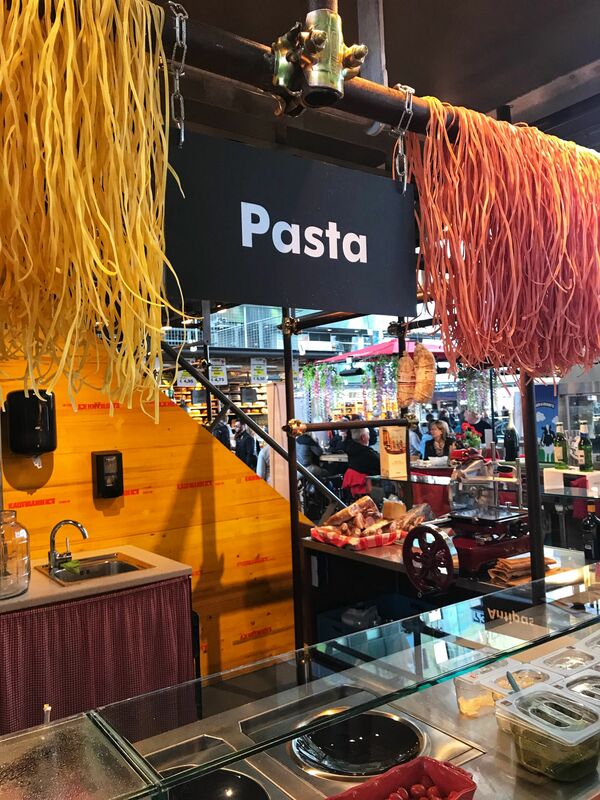 I was also surprised to see a Jamie’s Italian. It would seem the British Chef is rather popular in The Netherlands! 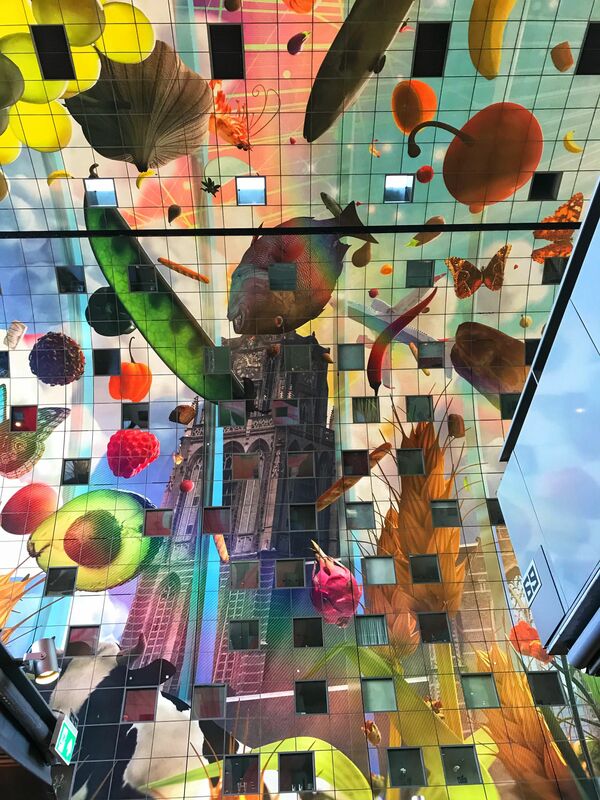 Don’t forget to look up to see the stunning artwork, Horn of Plenty, created by Arno Coenen using 4,000 colourful panels. 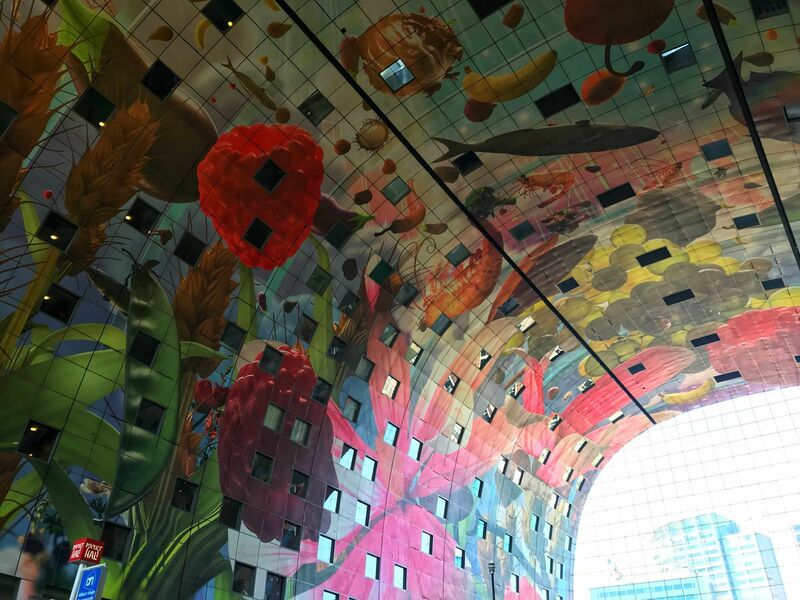 As you admire the mural, you can see the windows of the 228 apartments also housed within Markthal. Located underground is a four-storey car park, which has the capacity to hold a staggering 1200 cars! 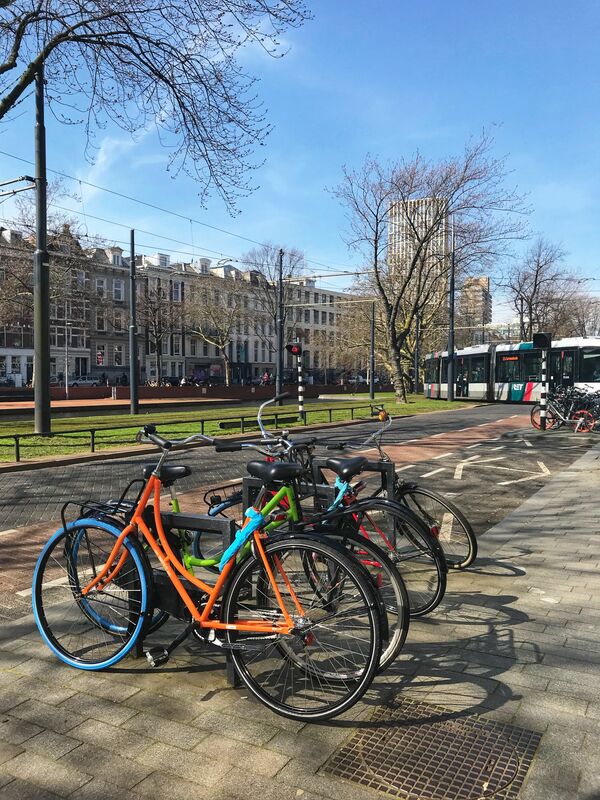 Though as with other cities in Holland, it’s the love of bikes that prevails; a Dutch heritage that is ever present in the city of Rotterdam. 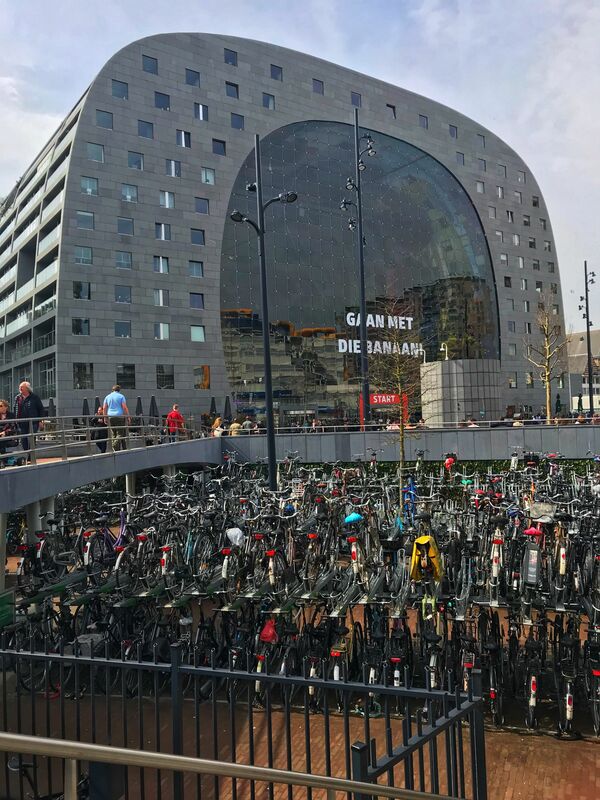 You’ve only got to see all the bikes stacked up during the Rotterdam marathon to appreciate the importance of bikes in the city. 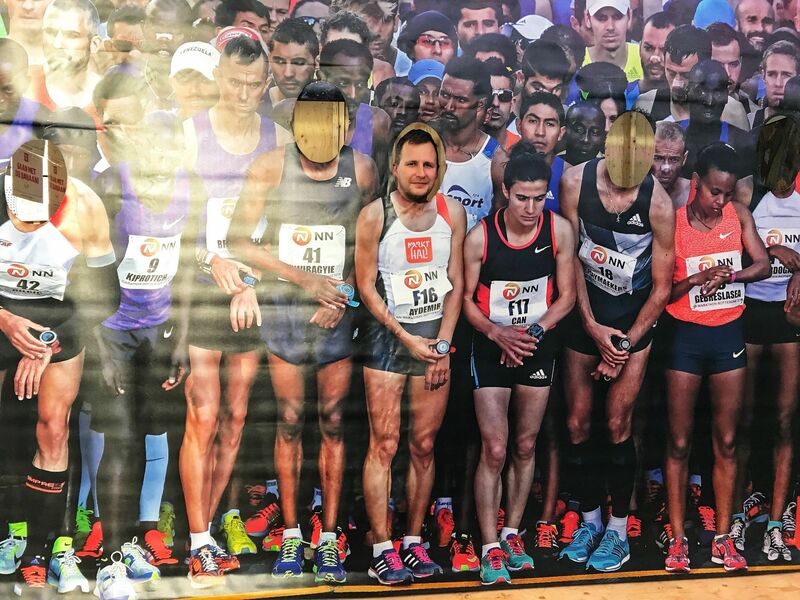 It was my first experience of a marathon and I got to see the love for the city first hand as citizens gathered to provide support for the runners competing for their chosen charities. An appreciation for their heritage was one of the most poignant messages I took from the city of Rotterdam. 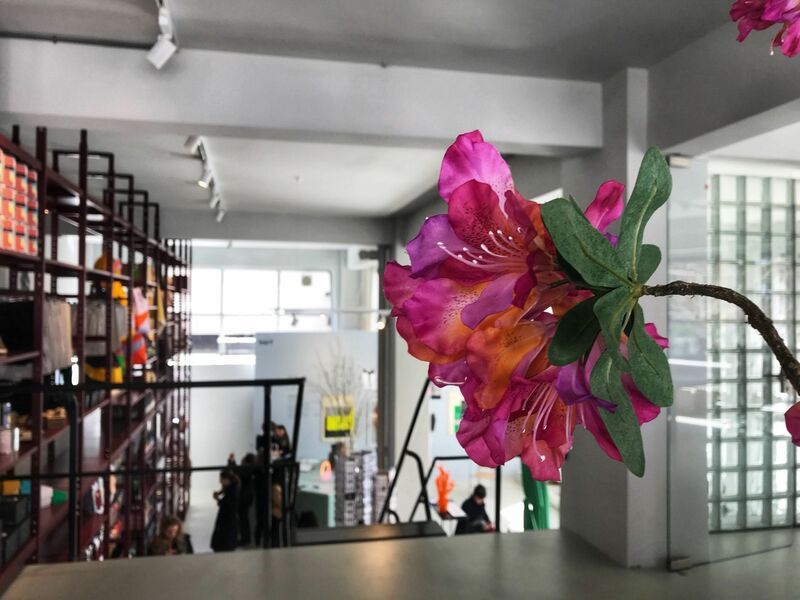 Whilst Rotterdam boasts a huge number of shopping retailers, from International brands such as Topshop and Zara to independent boutiques and art combined retail spaces, it’s the inspiration behind the traditional Dutch brands that offer consumers much more than a place to buy products. 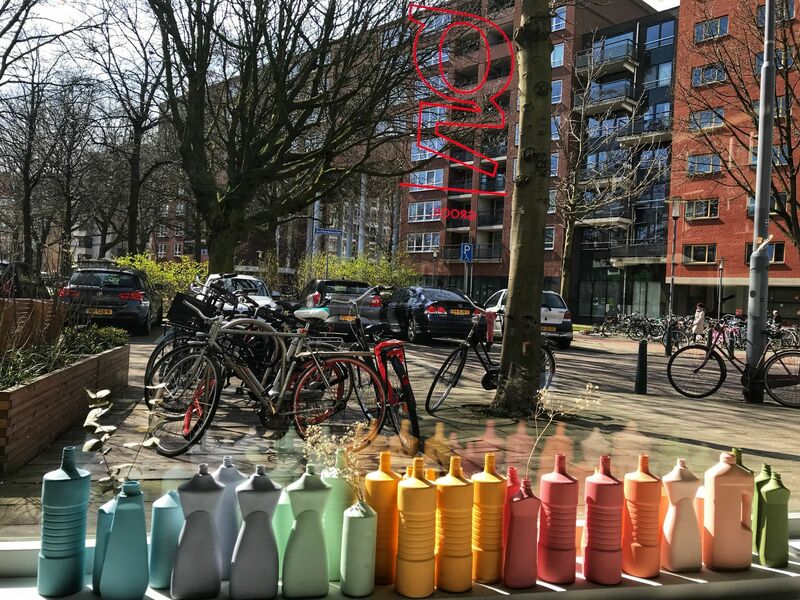 Groos is a store named after a forgotten Dutch word for pride. 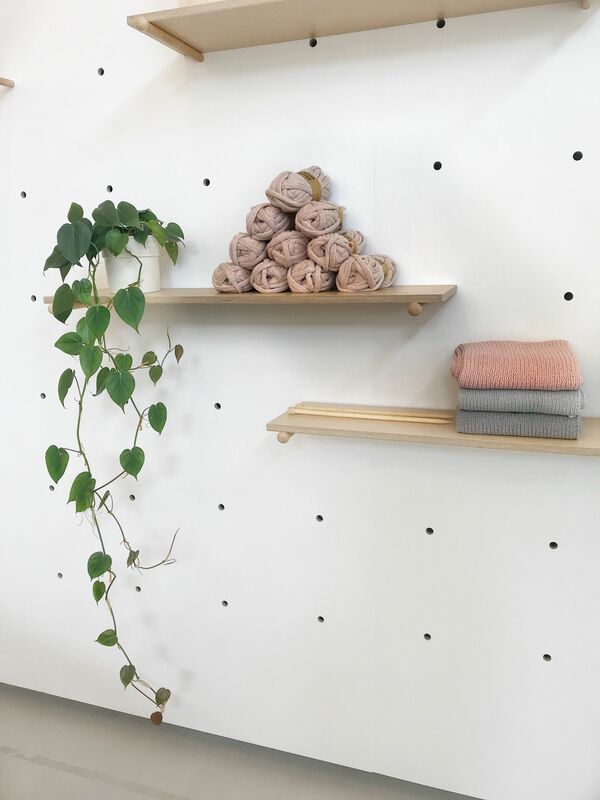 As the name suggests, the inspiration behind Groos is to share products of Rotterdam that the store is proud of, stocking only products made by designers living and working in Rotterdam. 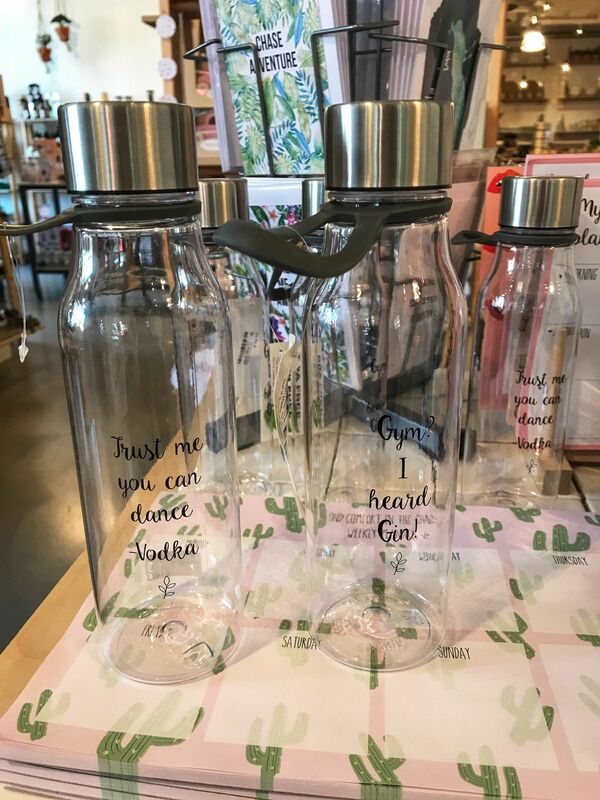 As well as a fantastic art space, Groos has a selection of literature, lifestyle and homeware products. 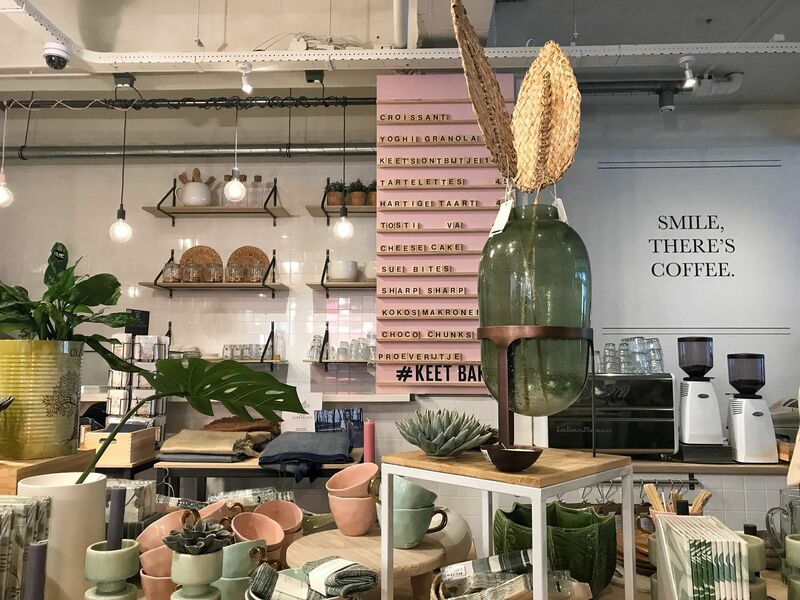 Keet is a concept store that helps start-up web businesses, enabling them to display their retail goods by renting a table or section of the store. 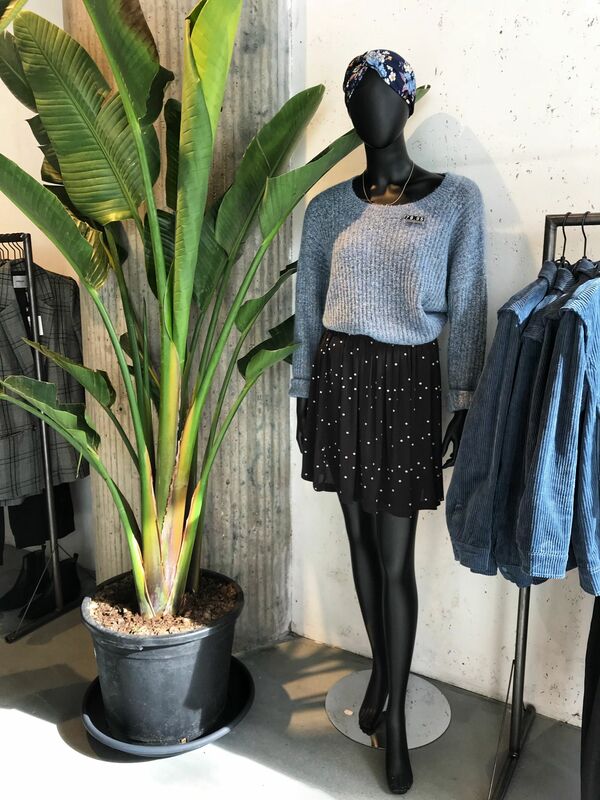 I have previously shared my love for Dutch concept stores on my posts about The Hague, Den Bosch and more recently, Eindhoven. 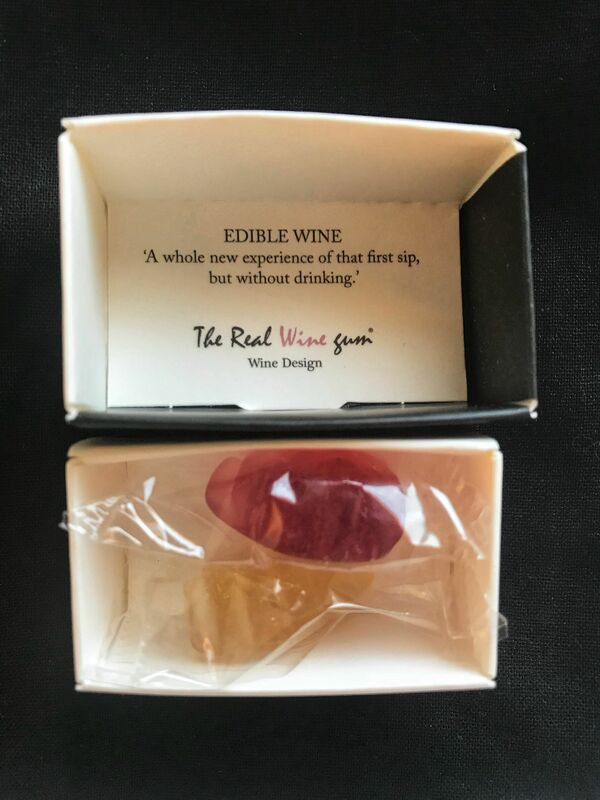 At Keet, there is a unique range of items from jewellery to edible real wine gums! Did I mention the store also has the cutest little cafe? 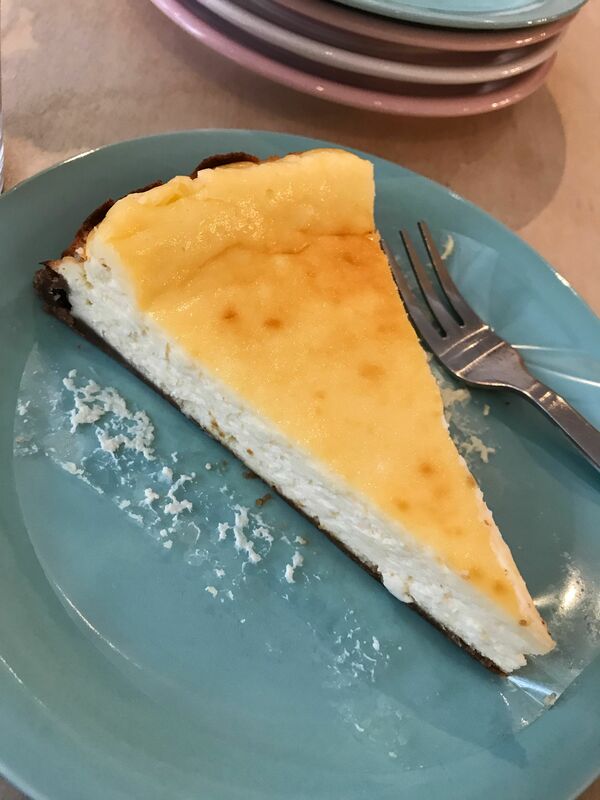 The cheesecake is to die for! 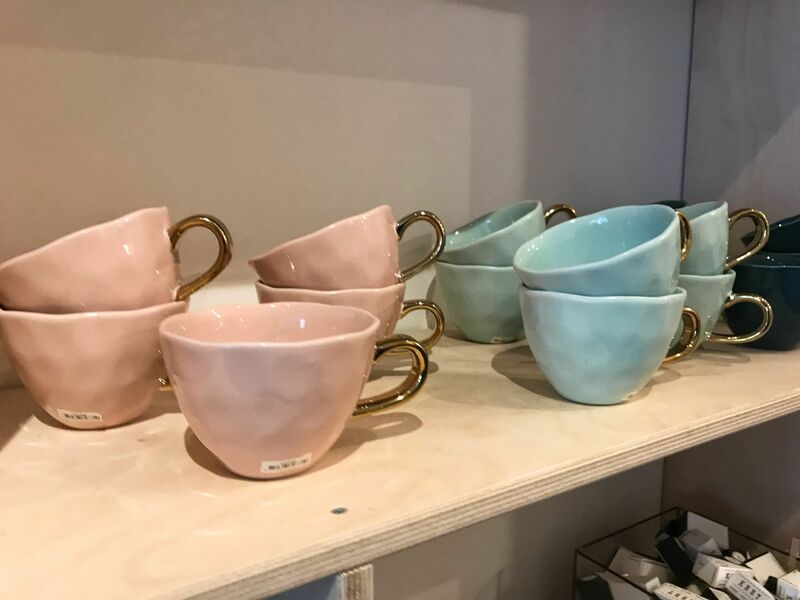 I only wish I bought these pretty mugs. 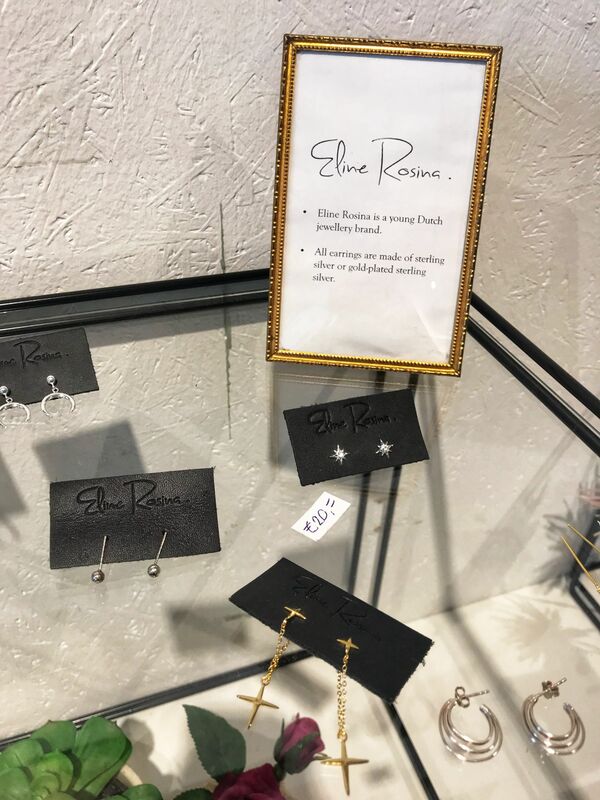 Ethics are at the heart of the retailers in Rotterdam. 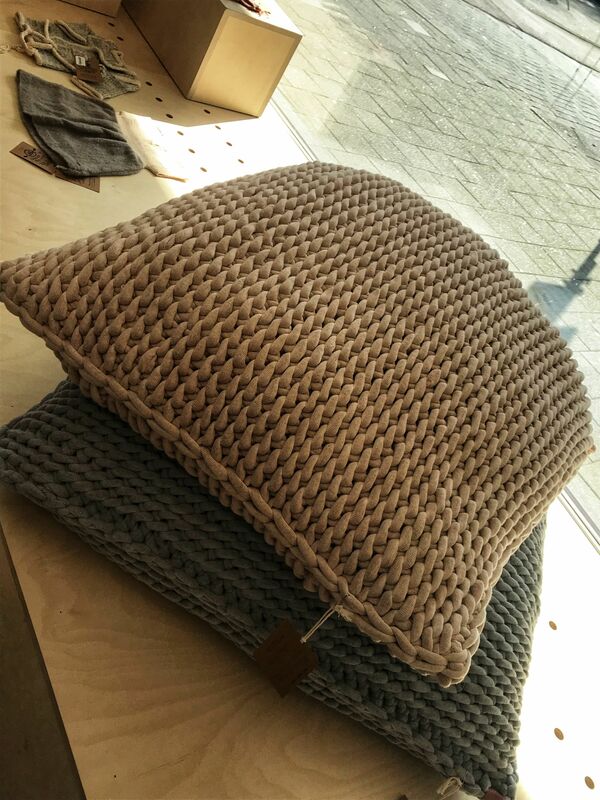 Local designer Susan Bijl uses ripstop, a strong and durable nylon to create a range of minimalistic bags as a substitute for plastic. 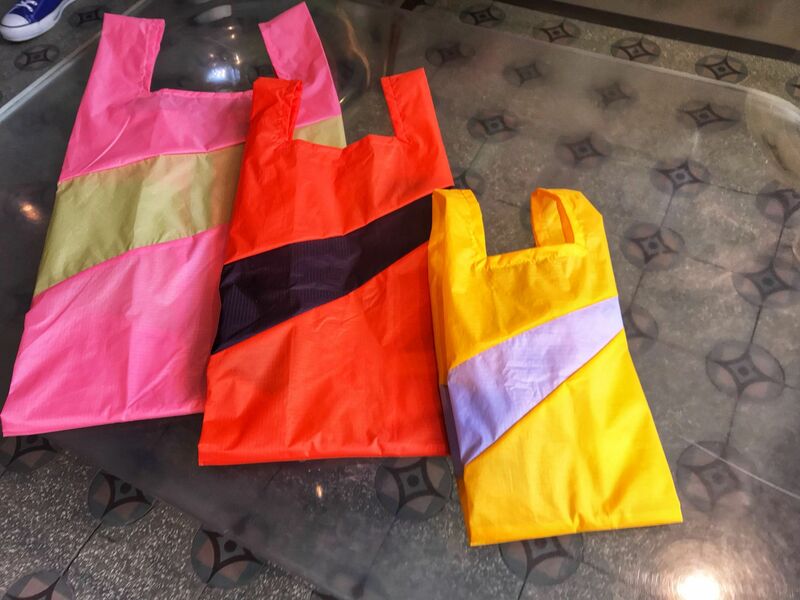 The material for her bold and brightly coloured bags is traditionally used to create kites. 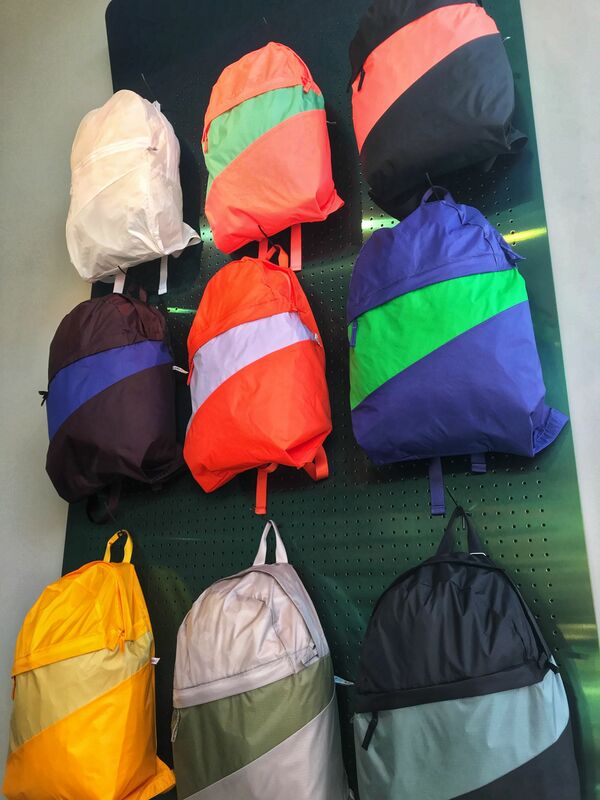 Susan’s environmentally friendly bright bags are even waterproof and are made even more distinctive with her signature ‘flash’ diagonal stripe. 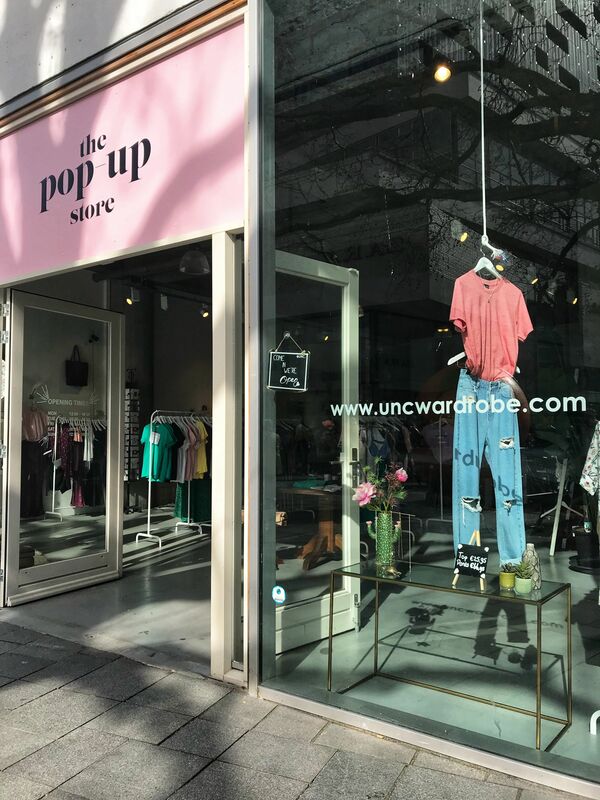 Check out her range of products at the 1975 store in Rotterdam. 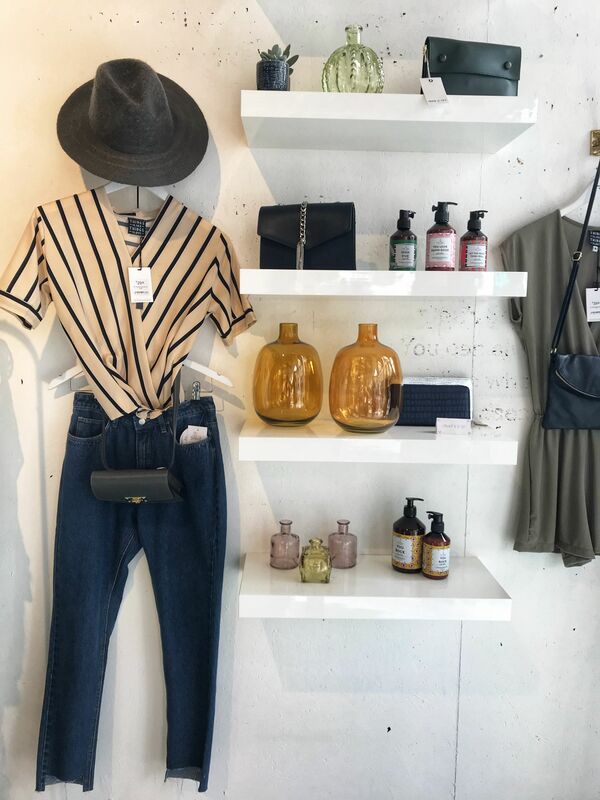 There was one store, in particular, that had my heart; I was truly touched by the heartfelt concept of the brand Granny’s Finest. 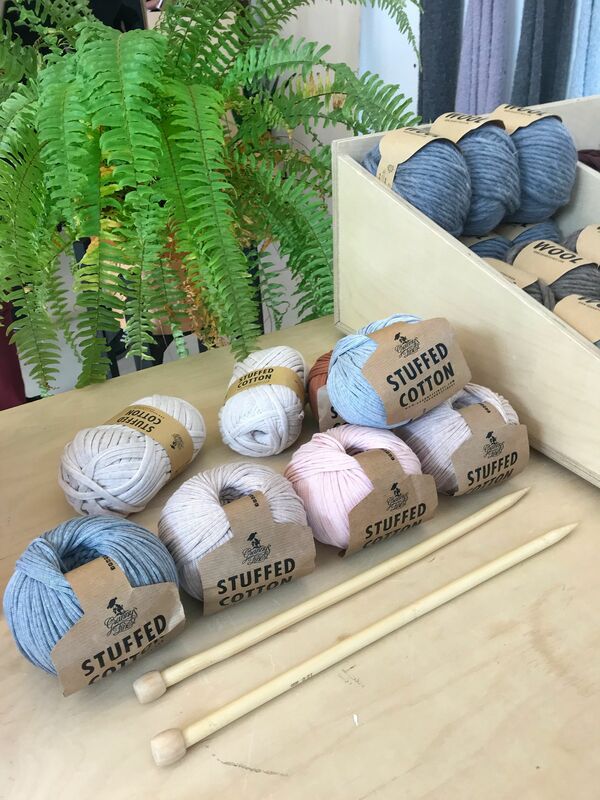 The brand’s purpose is to combat loneliness for the elderly, enabling them to create their own knitted designs in a social environment. The idea for Granny’s Finest came about after the owner visited his Grandfather in a nursing home. During this visit he witnessed an elderly lady knitting; a hobby she had to keep herself busy as she had no one to knit for. 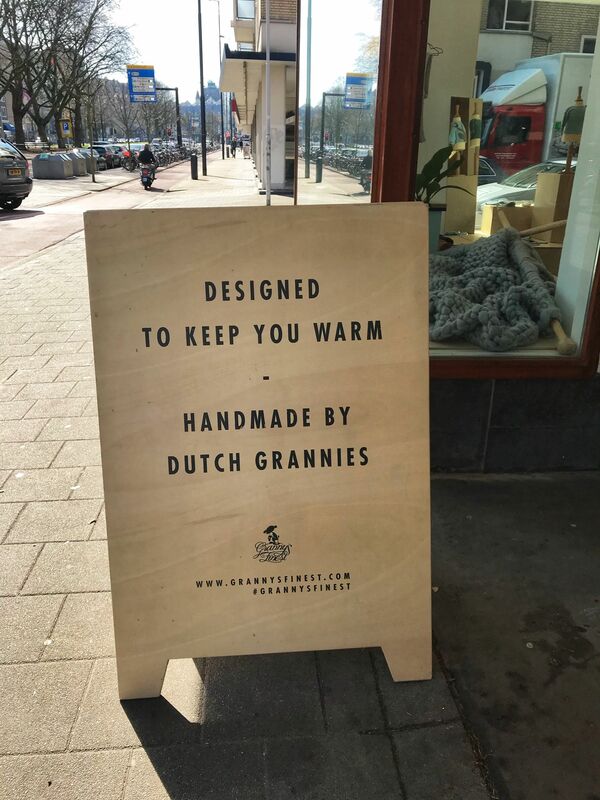 This visit struck a chord and Granny’s Finest was born to give other Grannies in Holland a hobby and a means to share their creations, with the proceeds used to fund their days out. 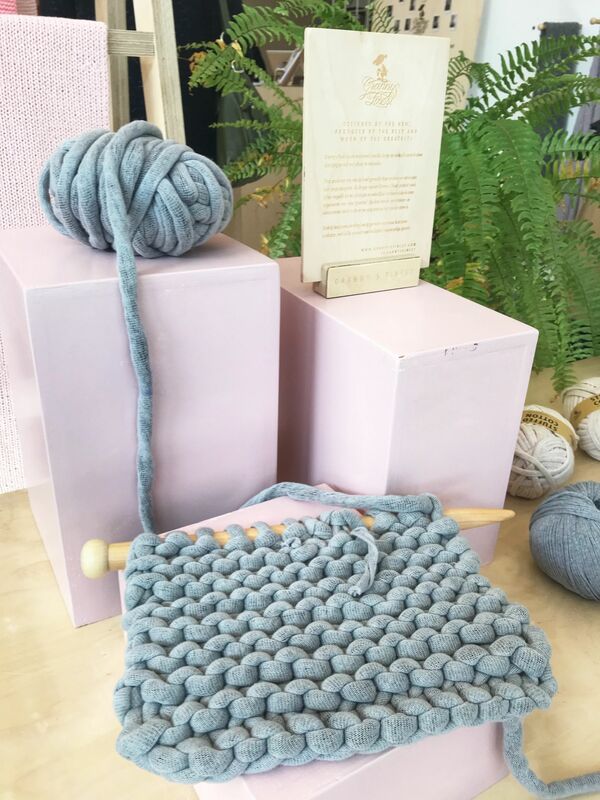 Granny’s Finest has 48 hand-knitting location clubs in The Netherlands, with around 800 Grandmothers that come together on a weekly basis. 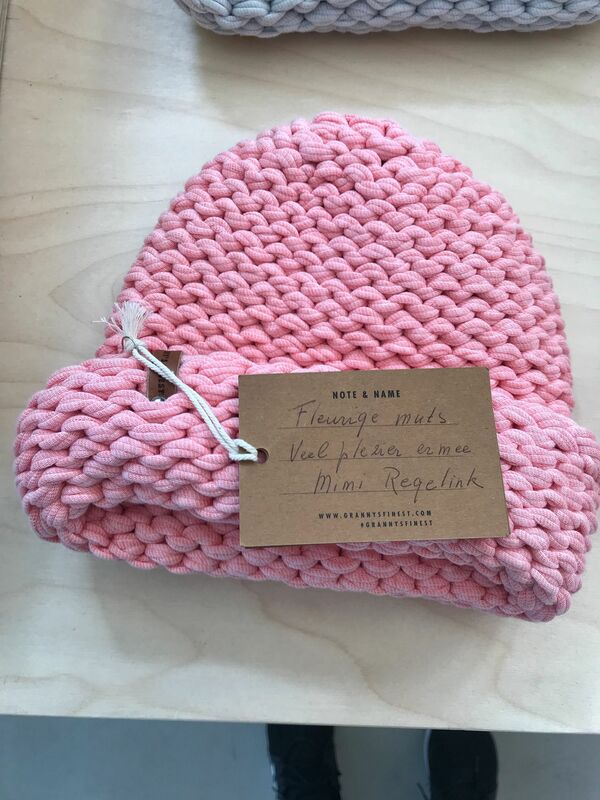 After creating their designs, the Grannies’ write a handwritten label, which not only lets the purchaser know which Granny created their design, it also asks the purchaser to share a picture of them wearing the product or send a postcard. These pictures and postcards are then shared with the Grannies who take pride in knowing their creations are loved and have gone to a good home. 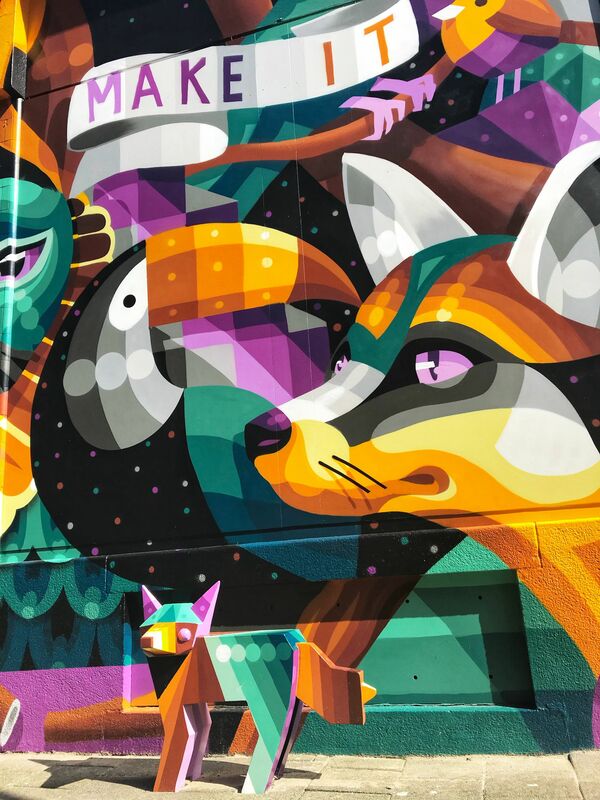 Rotterdam is a city that holds on to its heritage, whilst embracing a contemporary way of life. A city of defiance and, one that certainly hasn’t lost its heart. 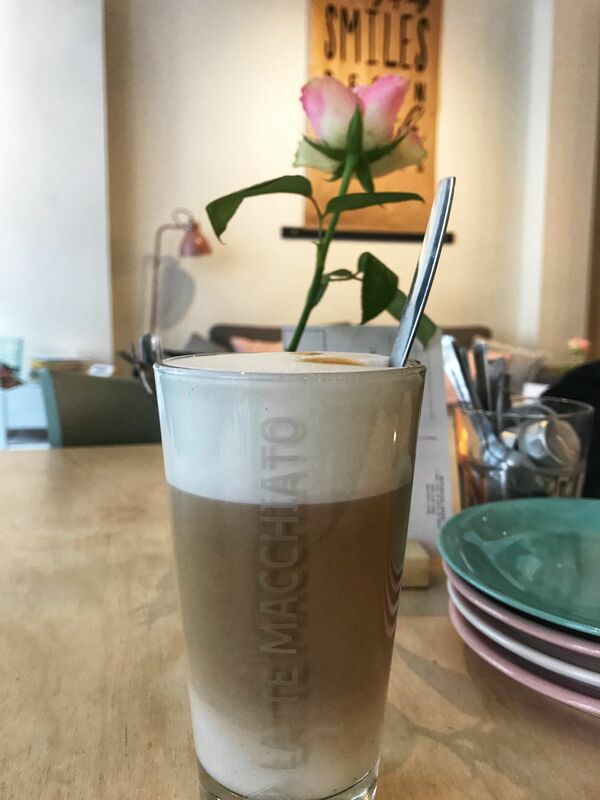 I absoloutely adore your travel posts Jasmine, you can tell you put so much heart and passion into them – I can’t imagine how long they take you to put together! 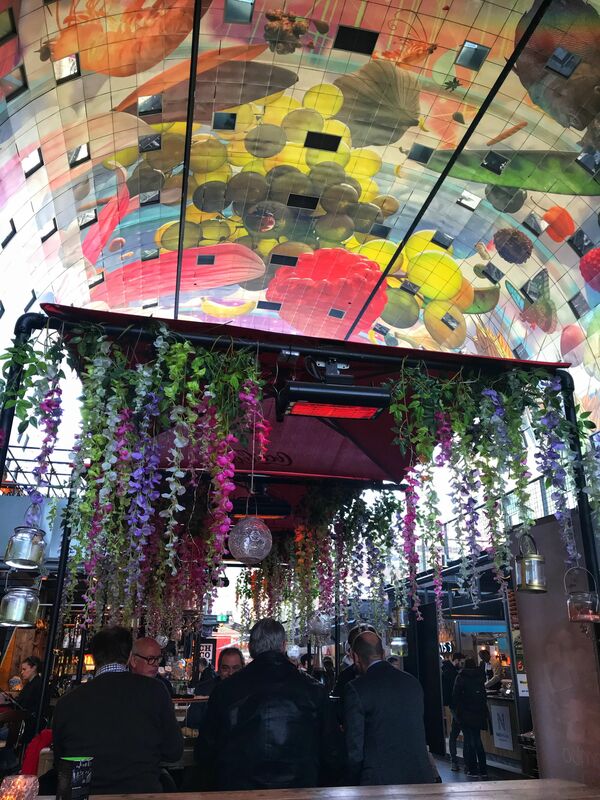 Rotterdam looks wonderful – so much to see and do! 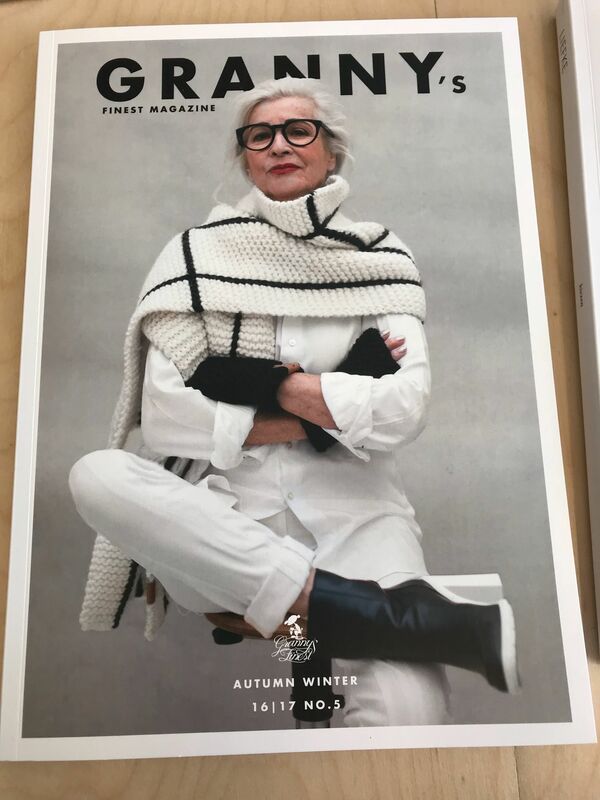 I really love the idea of Granny’s Finest, it actually warms my heart! I wish we had something like that here! Oh what a great post! I’ve never seen so much of Rotterdam before but I think it looks beautiful! 🙂 Thank you so much for sharing, I loved all of the different architecture! Wow there are some truly magical sights there! 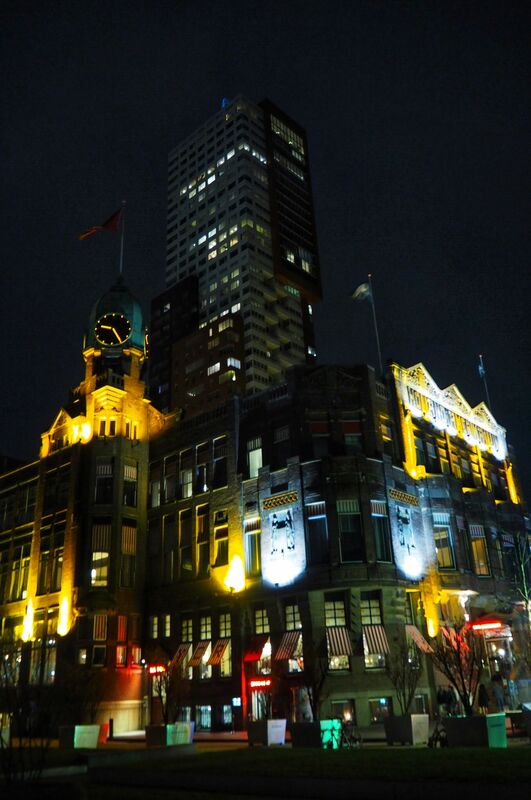 What an amazing post and it’s nice to see the city through your eyes, Jasmine. How many cities/countries have you visited so far? 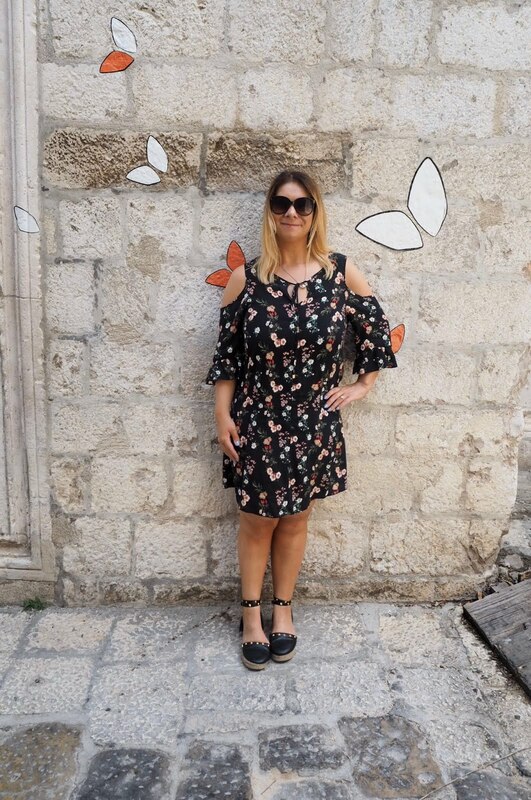 Loving these travel post you are making at the moment!